Explosive Report by Indian Magazine Exposes Those Responsible for 2002 Gujarat Massacre | Democracy Now! AMY GOODMAN: An explosive report by the Indian magazine Tehelka reveals new information about those responsible for the massacre of 2,500 Muslims in the western Indian state of Gujarat in March of 2002. The brutal violence against Muslims took place over a span of three days, followed an attack on a train carrying rightwing Hindu activists. Fifty-eight people on the train were burned to death when it stopped in the town of Godhra. Mainstream analyses have explained the statewide violence against Muslims as a “spontaneous” reaction to the attack on the train. However, Tehelka’s extensive exposé challenges this understanding of what happened in Gujarat five-and-a-half years ago and demonstrates that the anti-Muslim violence was highly organized and premeditated. The exposé was published in late October after a reporter infiltrated a rightwing Hindu organization for six months. It includes spycam video footage of Hindu activists bragging about killing Muslims and detailing the support they received from the highest levels of the state government. With state elections in Gujarat beginning next week, the exposé could have a significant political impact. Narendra Modi, who was Chief Minister during the 2002 massacre, never lost his position. He remains one of the leading contenders. Modi is from the BJP [Bharatiya Janata Party], which is tied to a network of rightwing Hindu organizations. Many of the activists interviewed by Tehelka say the anti-Muslim violence could not have happened without Modi’s tacit support. Haresh Bhatt is a BJP member of the Gujarat state assembly from Godhra. He said Narendra Modi gave Hindu rightwing activists three days to act with impunity. HARESH BHATT: [translated] He had given us three days to do whatever we could. He said he would not give us time after that. He said this openly. After three days, he asked us to stop, and everything came to a halt. It stopped after three days. Even the army was called in. All the forces came, and we had three days and did what we had to do in those three days. Yes, he did what no other chief minister could have done. AMY GOODMAN: An excerpt from Tehelka spycam videos implicating the Gujarat chief minister, the equivalent of governor, Narendra Modi. We go now to Tarun Tejpal. I interviewed him earlier this week and began by asking him to lay out the sequence of events that took place in Gujarat five-and-a-half years ago. TARUN TEJPAL: Well, what had happened was that in 2002, in what remains probably the most outrageous act of religious violence aided and abetted by the state, Hindu mobs — which were then designated as Hindu mobs, but now seems increasingly were Godhra workers of Hindu rightwing parties — they assaulted and massacred, killed, raped, more than 2,000 Muslims, unarmed innocent Muslims. And for five years, the whole version of what happened has been contested. I mean, there has been the version of the victims, there’s been a version of the state, there’s been a version of police, a version of civil rights groups. But there’s been virtually no justice or any remorse shown for what happened. What the Tehelka investigation, I think, brought forward was, for the first time in five years, the version of the men who actually committed the crimes. I mean, what the Tehelka reporter managed to do was get from the horse’s mouth exactly how these mass murderers killed — who they killed, how they killed, on whose orders they killed — and then, not just that, how the entire process of justice was subverted after the massacres were over and how many of these men have then been protected by the state. AMY GOODMAN: How has it been that it’s taken five-and-a-half years to expose what took place? TARUN TEJPAL: Well, you know, Amy, in India, this is not uncommon. We have some sort of an amnesia about these carnages and these riots and these massacres that take place periodically. There’s religious violence, but there’s also very often caste violence and class violence, and we are amnesiac about how we deal, you know, with these things. For example, if you remember, there were the 1984 riots against the Sikhs in Delhi by Hindu mobs after the assassination of Indira Gandhi, and more than 3,000 Sikhs were killed in 1984. And even today, twenty-three years later, only three people have been convicted for the killing of more than 3,000 Sikhs. So it’s not uncommon that for five years the Gujarat case has not come to a head. And as I said, you know, the way it’s dealt with in India normally is that charges and counter-charges begin to fly; there’s a whole miasma of contested versions that’s created in the public space. And the hope is that very soon a new tragedy will overstep the old one, and public memory will actually just let it slide, and things will go on. And it mostly does happen like this. Just that in the case of Gujarat, it seemed that the kind of schism that was actually going to hurt the very idea of India, the very idea of this great plural, modern nation, and so civil rights activists, in particular, and ordinary citizens have kept the issue alive, but did not receive the kind of shot in the arm for their work, until Tehelka broke this story, giving a shot in the arm. In all this, of course — let me just add that the central government, the congress government, which is — reigns at the center, continues to behave in a reasonably shabby and shameful way. AMY GOODMAN: Tarun Tejpal, explain the chain of command. Lay out for us exactly how it happened in March of 2002, how these events unfolded to this mass murder of more than 2,500 Muslims. TARUN TEJPAL: Well, you know, two things happened at that point. First, on the 26th of February, a train carrying a buggy full of rightwing Hindu activists was attacked by a Muslim mob near Godhra. Now, this Godhra incident has for a long time — the train incident, the killing of these fifty-nine Hindu pilgrims — has become a point of defense for the rightwing Hindu organizations who say that that’s what sparked the riots, which they claim were spontaneous. Now, the Tehelka investigation reveals that, contrary to what Narendra Modi has been saying, the Godhra incident was a spontaneous incident, not a conspiracy or a preplanned massacre, whereas what followed was a planned massacre and not a conspiracy. I mean, it’s just exactly the opposite way. I mean, our investigation reveals that what seems to have happened is that on the railway station at Godhra, there was an altercation between the pilgrims and Muslim hawkers who were selling their wares on the platform. And there was, it seems, an attempt to abduct a young Muslim girl by these pilgrims. Then, in the course of it, altercation. Then, when the train leaves the station, it seems somebody pulls the chain to stop the train, and Muslim mobs from the adjoining slums arrive in large numbers and attack that particular buggy. And in the course of this entire assault, the buggy gets burned down, tragically killing these fifty-nine pilgrims. What follows then is, as you just read out, the MLA of Godhra telling you — the elected legislator — it seems Modi gives his Hindu organizations and the mobs three days to get even. So the state sanctions three days of violence against Muslims. And in those three days, I mean, the police looks the other way, and these organizations, as is detailed extensively in our investigation, go ahead and massacre more than 2,000 Muslims. Women are raped. Children are killed. Groups of families are burned. Three days later, it does come to a stop, but by then more than 2,000 people are dead. And the police collusion, by the way, has also been fairly established by the Tehelka investigation. AMY GOODMAN: I want to play a clip that was secretly recorded. This is of Babu Patel, leader of the Bajrang Dal, the militant youth wing of the network of Hindu rightwing organizations. He was imprisoned for his role in the killing of Muslims, but was released on bail eight months later. When Tehelka spoke to him in September, he bragged about one of the most infamous incidents during the 2002 violence in Gujarat: slitting open the womb of a pregnant Muslim woman and pulling out the fetus. BABUBHAI PATEL, aka BABU BAJRANGI: [translated] It has been written in my FIR. There was this pregnant woman. I slit her open, sisterf****r, showed them what’s what, what kind of revenge we can take if our people are killed. I am not a feeble vegetarian. We didn’t spare anyone. They shouldn’t even be allowed to breed. I say that even today. Whoever they are — women, children, whoever — nothing to be done to them but cut them down, thrash them, slash them, burn the bastards. AMY GOODMAN: That was Babu Patel. Explain the significance of this group and how it ties up into the power structure. TARUN TEJPAL: See, Babu Bajrangi is today one of the founts of sort of bigotry in that part of Gujarat. I mean, he represented at that point an extreme rightwing grouping called the Bajrang Dal, which is associated with the mainline rightwing party, the BJP. And this man has been obviously deranged by the kind of poisonous ideology, the communal ideology, that is fostered by the right-wingers. And you can see the man has no remorse. For us at Tehelka, the most frightening thing about the whole investigation was that not a single person, not a single one of the mass murderers, exhibited any remorse. Now, Babu Bajrangi’s case is very interesting, because in other portions of the tapes on Babu Bajrangi, he talks about what happened after all this was done. He tells us that the home minister of Gujarat asked him to leave the state. So Babu Bajrangi, after his — after all the mass murders, called up the home minister of Gujarat, who said, “Leave the state.” Now, the home minister in India is responsible for maintaining law and order in the state. So the home minister says, “Leave the state, Babu.” Then the state actually gives this man shelter in another part of India. When the heat gets too much in Ahmedabad in Gujarat, because of civil rights noises and media noises, they stage an arrest for Babu Bajrangi and bring him back to Ahmedabad and stage an arrest. This is information being given to us by Babu Bajrangi, Babu Patel. He is giving us this information. Then, he says, the case goes to court. When it goes to court, the magistrate says, in Babu’s own words — the magistrate says, “You are such an evil man that you should be hanged, not once, but ten times.” So what happens? So Babu Bajrangi then tells us that particular case, the magistrate is transferred out. A second magistrate comes in. The second magistrate says almost the same thing, that “You are such an incredibly evil man, you should be hanged, not once, but ten times.” This is Babu telling us the story. The second magistrate is also moved out. A third magistrate is brought in. In the meantime, he also tells us that Modi is assuring him not to worry, things will be taken care of. So a new magistrate is brought in. And then Babu tells us, on camera, he says, “I am given bail, and so is everybody else. We are all freed up.” So this is the kind of incredible subversion of justice that is seen, even after the killings. AMY GOODMAN: So, Tarun Tejpal, can you talk about the significance of who Modi is — equivalent to a governor? And he’s running again for the governor of Gujarat, is that right? TARUN TEJPAL: Well, Narendra Modi is a national-level leader of the BJP, which is the rightwing Hindu political sort of umbrella party. And Narendra Modi was sent into Gujarat just a year before the Godhra incident and the Gujarat riots took place, and Modi was sent there to stop the slide of the BJP’s political fortunes, because they were on the decline, and the general understanding was that the BJP would lose this election. And then, Narendra Modi comes in. The Godhra incident takes place. The riots take place. The Hindu vote, which is by now very polarized, consolidates behind Modi, and Modi has a landslide victory. And Modi then becomes the chief minister, which is the equivalent of a governor in America, of Gujarat, which is a very prosperous state. And Gujaratis, by the way, are one of India’s greatest diasporas. I mean, they’re around the world. They’re all over America. And they’re a very strongly business and mercantile community, known for their ability to make money, to run very efficient businesses. And so, Modi has, for the last five years, reigned in Gujarat as a sort of an upholder of macho Hinduism, of aggressive Hinduism. And for everybody on the secular end of the spectrum, he remains the most hated figure in India, because they see in him an embodiment of everything that can go wrong with the great Indian democratic experiment if it begins to turn religious and communal. 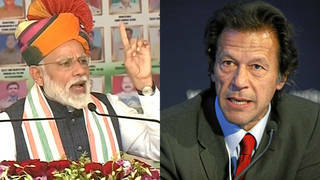 AMY GOODMAN: Now, Modi was supposed to come here and speak in the United States in 2005, but the US denied him the visa he required to come in, for part of the immigration rules around being responsible for serious human rights violations. TARUN TEJPAL: Well, I think that was a great victory for all those — all the secular fronts and secular forces that are trying to fight this kind of religious virus which is, you know, growing in India. I think it was a great victory, because it was an international snub. You know, it at least — though in India, we have not been able to defeat him electorally, or the people have not defeated him electorally so far, at least this was a clear international snub, that you will not be able to get away continually with the kind of record of human rights violations that you carry. AMY GOODMAN: Tarun Tejpal, you’re the editor of this independent weekly Tehelka. What has been the significance, the impact, of your magazine doing this exposé, not only the most important story of our time — the headline on the front page “The Truth: Gujarat 2002 in the Words of the Men who Did It” — but also the one that followed, “India Writes Back: An Avalanche of Hope and Despair”? TARUN TEJPAL: Well, I think the second one, the second cover, pretty much says it: an avalanche of hope and despair. You know, I mean, both things were seen after we broke this story. The first thing it did was it gave an incredible shot in the arm to civil rights groups and civil rights warriors and civil rights activists, because in India today, most of the big battles for the soul of India, for modernity, for democracy, for secularism, are not being fought by political parties, but are being fought by civil rights warriors who are very strongly still aligned to the founding region of India. The despair had a lot to do with the fact that people expected the national government, the congress government at the center in Delhi, to act with some amount of political will and political vision, and nothing of that has been seen in the last six weeks. I mean, the despair actually carries on. The fact that such testimony, such graphic testimony, has been brought into the public space — I mean, this is probably the first time in the history of the media that you hear mass murderers live telling you about how they killed and why they killed and who asked them to kill. And despite that, the center — that is, the congress government at the center in Delhi — has found itself unable to move and act. Most lawyers, most people in India think that the central government should have imposed president’s rule, which in India is the equivalent of a central rule, in the state of Gujarat, moved in and removed the state government of Modi and insisted that fast-track justice be done on the entire series of cases that have been pending for the last five years. Unfortunately, none of this has happened, and that’s disappointed a lot of people. Elections are due in Gujarat in a week from now, and everyone feels today that the congress’s inaction has to do largely with its need to make vote calculations and electoral calculations, and that, again, is disappointing, because one of the reasons for the continuing slide of public property, public discourse in India is the fact that everything today is only weighed in vote terms and electoral terms. AMY GOODMAN: Tarun Tejpal is the editor-in-chief of the magazine Tehelka, which just came out with this exposé on what happened in Gujarat five-and-a-half years ago, the slaying of 2,500 Muslims.